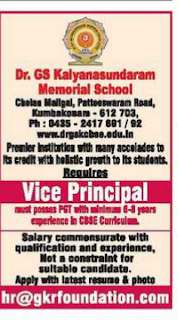 Dr. GS Kalyanasundaram Memorial School, Kumbakonam has advertised in THE Hindu newspaper for recruitment of Vice-Principal jobs vacancies. Interested and eligible job aspirants are requested to Apply immediately.Check out further more details below. About School:Dr. G.S. 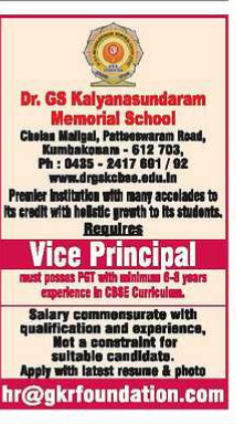 Kalyanasundaram Memorial School, Kumbakonam, is affiliated to the Central Board of Secondary Education, Delhi and offers education from Pre-primary classes to the Senior School Stage. Started with a small number of students in 2007, the school caught the imagination of the people of this temple city and the strength grew to 900 in the very second year. The strength of the school stands at 1982 presently.